Presented by IFD and dubbed into English as King Of Prodigal Boxers (original title: Deadly Duo), with solo credit going to A Jacky Wu while Hong Kong Movie Database lists Chi Lian as co-director (neither have further credits). There's also no new scenes of Western characters inserted into it IFD-style it but I suspect some editing WAS done to to land at the final 83 minute running time. Something that would've been beneficial had the action and revenge-drama of it all had any bite. Somewhat refreshing in its initial stages as the beats needed to get Chen Kuan-Tai to Hong Kong are dealt with in 10 minutes (including the murder of the elderly and kids) but you do worry if the filmmakers are going to be able to fill 83 minutes at this pace. Low budget and working off standard tools of melodrama and revenge, it's clear King Of Prodigal Boxers has no skill or desire to play with the big boys of drama but instead focuses on delivering the dark, bloody and action-tinted in the next 73 minutes. Too bad there's way too few glimpses of it. 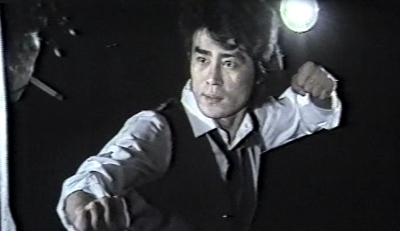 The location work is welcome since it gives this story an opportunity to make the gritty a tool in its favour and an early fight scene with Wong Goon-Hung in a parking garage strikes the right balance of messy but impactful. But the developments throughout are at best run of the mill and the escalation of violence loses its luster when the makers don't have the tools to convey the grim convincingly. This is evident in a scene where several people are hit by a car and all they can do is to depict this in choppy edits but also the lack of distinction in the character gallery makes out of the blue deaths pretty pointless. Chen Kuan-Tai and Woon Goon-Hung are stoic, standard and reliable presences and the shotgun violence towards the end is partly very spot on. But by this point basic motivation is gone and the initial, fast paced Chen Kuan-Tai movie forgotten and buried.